US$ 1290 / person ? 1 Arrival to Bagdogra, drive to Jaldapara Arrival by flight to Bagdogra airport. Drive to Jaldapara National Park and accommodation. There are two options to sleep. Tourist Lodge which has comfortable rooms and cottages outside the park or Hollong Bungalow inside, with more basic facilities but possibilities to see the animals right from the window (on extra cost and need to be booked ahead). 2 Jaldapara – Thimphu Safari on the elephant starts early in the morning. Riding the elephant is interesting experience itself. It's surprising how silently the giant animal moves through the jungle. 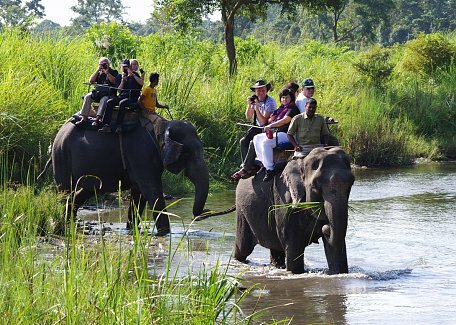 If you're lucky, you might glimpse one horned Indian rhino and other animals like muntjak or sambar deers, peacocks, gaurs (wild cows) and various birds living here in jungles around Torsa river. After safari start drive to Thimphu. In the bizarre twin border town of Phuntsholing/Jaigon you will have lunch and while fixing your immigration formalities. Also visit o beautiful decorated Kharabadi gompa. From here you can clearly see how the Himalayas are swiftly raising from Indian plains. Driving further, you'll reach to high altitude soon. The climate and nature character will change vastly. By the evening you will reach the capital city Thimphu. 4 Thimphu Early morning drive to Buddha Dordenma, the gigantic statue of Buddha overlooking the valley and walk to striking city viewpoint. Walk in Norzin lam street and see the traffic police signaling in junctions. Thimphu is only capital in the world without the traffic lights. Finish walk at handicraft market where many interesting Bhutanese souvenirs can be seen and bought for reasonable price. Continue with visit to Folk Heritage Museum with the exhibition on traditional village life in Bhutan (closed on Sunday, alternatively visit Simply Bhutan museum). Alternatively cut previous program short and explore the Thimphu town on your own. Evening visit of Tashicho dzong, the castle, which serves as seat of the king and government. 5 Thimphu – Gangtey Transfer to Wangdue Phrodang over Dochu-la pass (3010 m) with visit of royal temple Druk Wangyel lhakhang. Descend to tropical valley of Punatsang chu river. Soon after lunch you will start driving up to the mountains again until you reach pristine Phobjika valley (2750 m). Optionally you can attend lesson on Buddhism led by accomplished master with translation to English in Gangtey monastery shedra (buddhist college). You might also like to spend overnight in welcoming local farmhouse or even try the hot stone bath, traditional Bhutanese treat. 6 Gangtey – Wangdue Visit of historical Gangtey gompa. 2½ hour walking tour through the valley is one of the most beautiful and easy hikes in Bhutan. You will go through the buckwheat and potato fields to the mixed forest with trees decorated with old men's beard lichen and finally you will get a view of marshland. Here, in late autumn and winter, rare black neck crane can be seen. Even if the cranes are not here, we can visit Black Neck Crane Center which has interesting exhibition about this elusive bird. Finish hike with the picnic lunch. Drive back to Wangdue. 7 Wangdue – Paro Early morning hike to Khamsum Yulley Namgyal Chorten with wonderful view of the valley and it‘s terraced paddy fields. See the longest suspension bridge in Bhutan stretching the length of 350m over Pho Chhu river. Visit of Punakha dzong, which counts as the most intricately decorated castle in the kingdom. Short walk to Chhimmy lhakhang temple, devoted to 15th century saint Drukpa Kunley, know as “Divine madman”, who did taught Buddhism by singing, drinking and rampant sexual behavior. If time permits, also visit Sangchhen Dorji Lhuendrup Lhakhang nunnery with Bhutanese and Nepali style stupa, overlooking the valley from the high hill. Evening drive to Paro. 8 Paro Morning visit of National Museum and Paro dzong, castle where Bernardo Bertolucci’s Little Buddha film was shot. After lunch we will go to Kyichu lhakhang, the temple built in 8th century by Tibetan king Songtsen Gampo. Climb to Taktsang gompa (Tiger's Nest), most venerated and holy place in Bhutan overlooking valley from the steep cliff. 9 Departure Depart from Paro airport by flight or drive to land border in Phuntsholing. Going opposite way: Tour might also be organized in opposite direction, landing in Paro, finish in Jaldapara and departure from Bagdogra. Please inquire for itinerary. Our journey through Bhutan thanks to the commitment of all people from Firefox will long remain in our memory.